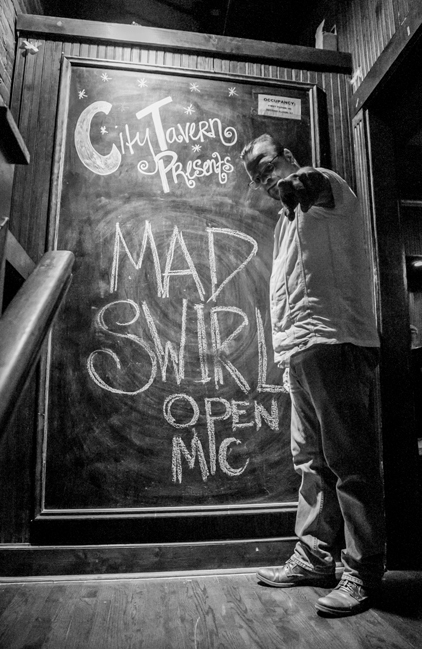 A HUGE shout-out to our NEW mad mic home, Dallas’ badass’d City Tavern​! If you couldn’t make it to the debut show and wish you coulda, there’s some live feed action recorded on our Mad Swirl FB page but it pales to being there. Thanks to all who came out to the City Tavern & shared in this mad-mentous collective deliciousness. What a night of the beat-utifullest poetry and music it was! HUGE thanks to Krude/Swirve Walker for taking us to another dimension of time and space on the wings of their jazzy madness! Gigantic grats too to our Viking sound and lights guru Thad & cheers to our burly bartender Ben for keeping us buzzin’ all night long! Heaps of thanks to ALL of you who freely shared their hand claps, finger-snaps, hoots and howls with all the mad ones who got up on this sacred mad swirlin’ mic. HUGEST thanks to The City Tavern’s proprietor Joshua Florence​ for blessing us with our new digs and welcoming us mad ones with open arms and giving us a swirl’n space we can call home.